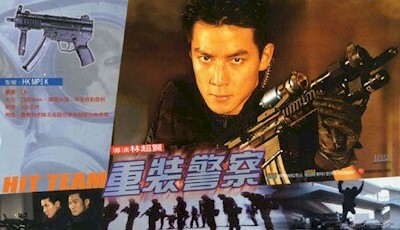 Daniel Wu on a lobby card from Hit Team. The Skinny: Well-done action film from director Dante Lam succeeds thanks to attention to detail and character. While not living up to his best work, this film is still a welcome genre entry. by Kozo: Routine actioner from Dante Lam succeeds thanks to attention to detail and believably human performances. Another in the “cop soap opera” genre, Hit Team details the clash between two groups of cops. One is the special “Hit Team,” designed to go after heavily armed bad guys, and the other are a group of rogue cops robbing underground banks. Alex To leads the rogue cops, who are actually stealing the money to fund an operation for their crippled buddy Chin Kar-Lok, who was shot by evil triads and hung out to dry by his superiors. The Hit Team is led by Daniel Wu, who manages to show a surprising intensity as the serious squad leader. Right off they suspect that the robberies are done by cops, and as the truth comes to light things get a bit complicated. Of course Daniel disagrees with what Alex and his pals are doing, but he agrees with their purpose. Ultimately, decisions are made and things are explained through action rather than words.